John Munro Longyear, a noted developer of timber and mineral lands in the Upper Peninsula of Michigan became the central figure behind the Arctic Coal Company which surveyed and mined coalfields on Spitsbergen, now Svalbard, from 1905 to 1916. This company developed a settlement on Spitsbergen able to accommodate up to around 500 people which became known as Longyear City, now Longyearbyen, adjacent Advent Bay. Born in Lansing, Michigan, Longyear served as mayor of Marquette, Michigan in 1890–1891. He was one of the founders, ca. 1890, of the Huron Mountain Club near Big Bay, MI. In 1906 he founded the Arctic Coal Company with long-time associate Frederick Ayer and several other small shareholders. 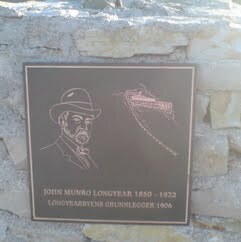 John Munro Longyear was the main owner of the Arctic Coal Company with headquarters in Boston, USA. Longyear had visited Svalbard in 1901, and bought the Tronhjem Spitsbergen Kulkompani in 1906. Store Norske Spitsbergen Kulkompani started as a consortium of Norwegian investors in 1916. It purchased the Arctic Coal Company's and Ayer and Longyear's lands and operations on Spitsbergen in that year.